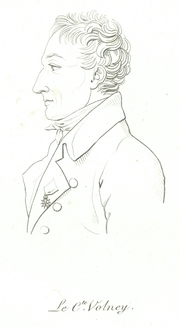 Constantin François de Chassebœuf, comte de Volney. In sum, Volney has been forgotten because neither the academic left nor the religious right has an interest in seeing his memory or his works brought to light—Volney has fallen into an Orwellian “memory hole.” But Thomas Jefferson obviously saw some kind of value in his book. So much value, indeed, that he took the time to translate it into English. That’s quite a recommendation. And given the state the world’s in today, perhaps it’s time to give Volney and his Ruins of Empires a second chance—and a second reading. References: Gilbert Chinard, “Volney et l’Amerique,” Baltimore (1923); Jean Gaulmier, “L’Ideologue Volney,” Beirut (1959) and Geneva (1980). C. F. Volney is currently considered a "single author." If one or more works are by a distinct, homonymous authors, go ahead and split the author. C. F. Volney is composed of 19 names. You can examine and separate out names.